It has been a summer of food, gardening, renos and photography. Fresh fish from Pacific Ocean, live lobster and scallops flown in from Eastern Canada, herbs, berries and veggies from the garden, a few cool updates to my kitchen and some handy new gadgets to experiement with! Indeed the summer has been busy! The weather has been amazing, hot and at times humid, which made for some amazing storm clouds to develop over the field across from my home. And I was lucky to catch some of them with my camera. With much to share, we will start with my latest project. With another successful fishing trip to the coast I have a nice little selection of fish in the freezer. Again halibut and salmon were the largest of the fish caught and even a rarer White King Salmon was among the catch and infact the largest of the salmon at 27 pounds. Looking for a different way to handle the salmon I started looking into what it takes to can fish. I immediately knew I would need to invest in the pressure cooker/canner. I decided to go with a 22 quart Mirro. While doing my recipe research I found that every recipe I looked at using a pressure cooker was designed for either the 16 or 22 quart cookers, nothing smaller. With a cooker in place I worked out the recipes and read and reread the technique used for the process. Since I knew I would essentially be double cooking the fish I wanted to try and maintain as much moisture as possible. That meant first I would brine the salmon before it was smoked. Then I would add liquid to the jars just before canning. The smoking part of the process was kept short, only going an hour in the smoker, with a full liquid tray. Combine all of the brine ingredients in a large pot over medium heat. Simmer and stir until all sugar and salt is disolved. Place the salmon, with skin on, scales removed, into a large container with a lid. Add the cooled brine and place into the fridge overnight. I used 2 kinds of salmon. Chinook and the White King salmon. The salmon was brined for 18 hours. Remove the salmon from the brine and rinse under cool running water. Cut salmon into strips close to the size needed to fill the jars. Spray the rack from the smoker well with non stick spray. Place the salmon on the rack, skin side down leaving a bit of space between the pieces. Glaze with a 50/50 combination of pure maple syrup and Rogers Golden Syrup. Place the rack on the top setting in the smoker and smoke for one hour. Have all jars clean and sterilized and in hot water. All lids and rings should be in a pot of water, slightly simmering on low/medium heat. Fill the canner with the proper amount of water for your model. I used 4 quarts for this application. Remove the salmon from the smoker and allow to cool for a few moments. Gently fill the jars with warm salmon, leaving ¼ headspace in each jar. Drizzle with a touch of canola oil. I then topped each jar with 2 heaping tablespoons of Rogers Golden Syrup. Clean the rims of the jars with a hot clean cloth, add the lids and rings until finger tight. Place on the racks of the pressure cooker. Place and secure the lid on the cooker. Now crank up the heat! You want the pressure cooker to get fully pressurized. Once that happens and the cooker begins to let off a steady stream of steam, start timing for 10 minutes. This is a very important step, do not skip. Once the 10 minutes has passed add the 10 pound weight and maintain the cooker just under 10 psi for 110 minutes. After 110 minutes remove the canner off the heat and allow to cool for 1 hour before removing the lid of the pressure cooker. Remove all jars and allow to cool completely. You can open a jar and enjoy it immediately. I am very pleased with how the first 2 batches have turned out. It is sweet and smoky perfection! It was a very successful trip! The picture just shows the salmon caught, there was also a few 100 pounds of halibut, some black sea bass, a few red snapper, a handful of rock fish and a few cod, for fish and chips! I let the men fillet the fish! Though I am on the hunt for a super sharp sushi knife so I can do it myself. This salmon turned out quite fantastic! I am definitely going to be playing around with flavours and conbinations with the rest of the haul! Thanks so much for stopping by! I hope you have a spectacular weekend! Wow, what an incredible haul! The fish look perfect, and that’s a pretty impeccable filleting job. 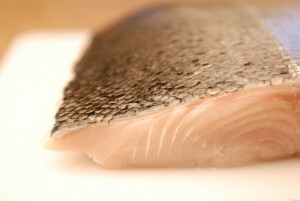 I recently bought fresh wild salmon and filleted fish for the first time – it was a hideous hack job! Your sweet & smoky canned salmon sounds and looks delicious.